60% cotton/40% polyester 5 ounce short sleeve brushed twill shirt. 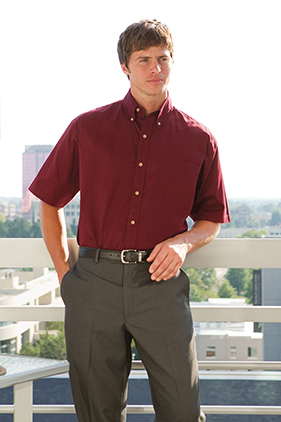 Men's 623 features a button down collar and left chest pocket with pencil slot. Center back pleat. Ladies 625 has an open collar plus front and back darts for a trim shape. Both are full button front with woodtone buttons.